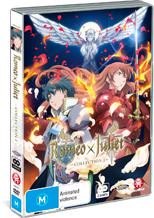 Loosely based on the classic Romeo and Juliet story by William Shakespeare, this is a great anime interpretation of the story. In the anime interpretation of this famous tale, it is set in the fantasy world of Neo Verona, where the house of Capulet rule the lands with peace, until the Montague decide to plot and overthrow them and unfortunately for the Capulet's, they are successful. After Juliet's family, the Capulet's were murdered by Lord Montague, thankfully the two-year old Juliet managed to escape with the help of some friends. To keep this secret hidden, Juliet was forced to dress and act as a boy and to compound the situation, she has fallen in love with Romeo who also happens to be the son of Lord Montague. With the ruling of the Montague family, the citizens of Neo Verona are quite uneasy and with a chance to redeem and rebuild her family, Juliet decides to take back her family sword in order to bring her people out of hiding and put her family back where they belong. Unfortunately things are not as easy as they seem, especially with Romeo being a Montague. As the series progresses, the characters really open up to the viewer and the story gets more engaging. The battles are very well choreographed but the highlight for me was the great anime (artwork) which was quite crisp and stylised. Add in some great lighting and it's almost like watching a canvas come alive. The beauty of Romeo X Juliet is the mythology of the series that goes beyond just a standard setting of Merry old England but rather, it is set in an alternate universe of might and magic. Of course, Julie and Romeo are the main characters and their relationship is the key part of the story that is actually quite interesting to watch unfold. The video quality of Romeo X Juliet is presented in 16:9 widescreen that boasts sharp images and a great colour palette with strong levels of black. Add in some professional voice acting for the English dub, great sounds and an interesting soundtrack and Romeo X Juliet is a well made production. When it comes to extras, there is a making of documentary, text less songs and an art gallery. If you're a fan of quality anime than this is the collection to investigate!